Note 8/29: this is slightly incomplete, links and cleanup, etc. forthcoming, and drafted just before the report itself is supposed to be published. It's based on early previews and what I know. As the report comes available, I'll add notes, including anything that improves the dismal view I'm taking of their performance. Note: 8/31 and into 9/1: With a few additions and still no concrete news, this preview is complete. Note 9/3: The report is now available - UN PDF page - and I fixed more typos here. Any changes or corrections from here will be dated in the text. 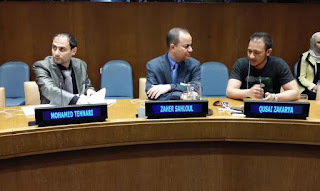 Investigators from the United Nations and the Organization for the Prohibition of Chemical Weapons (hereafter OPCW - logo at right) one year ago set on a joint study of recent allegations of chemical weapons usage in Syria. The Joint Investigative Mechanism (JIM) they formed at that time recently finished its work and issued an initial report. This is to be published on August 30, but was first shown on the 24th to members of the U.N. Security Council, and to the New York Times, who published Syria Used Chlorine in Bombs Against Civilians, Report Says. This marks "the first time the United Nations has blamed specific antagonists in the Syrian conflict for the use of chemical weapons," the Times notes. The JIM considered nine incidents, three of which it will examine more and report on in September, three it thinks will be too murky or "conflicting" to decide (see below), and three it was able to decide the blame for already. In one case of Islamic State used sulfur mustard (mustard gas), and in two, the Syrian government used chlorine bombs dropped from helicopters. One attack was in April, 2014 and the other in March, 2015, both in the northern Idlib province. This portion is more politically significant and the focus of all below. The preview happened to come out 3 years and 3 days after the infamous Ghouta alleged sarin attack - helping emphasize how chlorine is just as much a banned weapon. Conveniently for some, this preview was able to make the news in time for US-Russia talks on Syria's future. As the Times says "The panel’s findings further damaged the credibility of President Bashar al-Assad" and raise the likelihood of a renewed push "to impose new penalties on Syria." The report was enthusiastically embraced by the United States ruling elite. A U.S. National Security Council spokesman said "It is now impossible to deny that the Syrian regime has repeatedly used industrial chlorine as a weapon against its own people." (The Daily Beast) Samantha Power, the U.S. ambassador to the United Nations, said in a statement that “this horrific and continuous use of chemical weapons by Syria represents the greatest challenge to the legitimacy of the (Chemical Weapons Convention) since it entered into force, and an affront to a century’s worth of efforts to create and enforce an international norm against the use of chemical weapons." However, as we know, claims in support of a regime-change campaign are not guaranteed to be true, even when dead babies and/or incubators are involved.. And this is a case where the factual relevance of the JIM's findings is highly questionable. - An Alternative View on Ascribing Blame for Alleged Chemical Weapons Attacks in Syria - PDF, 10 pages * (phone number removed, several typos fixed, some clarity edits, otherwise just as sent). We have good reason to suspect these chemical incidents are mostly or all by opposition actors, with Jabhat al-Nusra most commonly implicated. If so, hundreds of Syrian civilians were selected for death by rebels, sacrificed in a cruel bid at outside support. ... If this is the case with these incidents - and the size of that if should be one of your most serious questions - will the OPCW be among those who helped expose the terrorists responsible to be held accountable? Or - given the hypothetical - will they be among those who enabled the criminals to avoid blame, stay on the field, and continue their murder and deceit? It sounds like they weren't swayed by our highly relevant findings. This summary covered both the 2013 sarin and 2014-2015 chlorine phases of CW allegations. It was decided the JIM would only look into the latter, so the best half of our points became irrelevant. The relevant points from the submission, plus a few more worth adding to the record, form the counter-arguments to the chlorine claims below. As in the report, these are either from this blog or, more often, the affiliated research wiki A Closer Look On Syria (ACLOS). Chlorine is easy to get for either side. Syria's primary or only chlorine factory, near Aleppo, was seized by rebels in August, 2012, and then taken over by Jabhat al-Nusra in December. The owner estimates 400 tons of chlorine gas were stored there, barring fresh production. It can also be seized from other locales terrorists overrun. And, as we'll see below, it can be synthesized from scratch, on site, in the small amounts needed for any one attack. It's alleged these attacks used "barrel bombs" dropped from helicopters. Once that's accepted, an automatic presumption of government guilt follows, though it might be unfounded. Russian Tass news adds, after seeing the report as provided to Russia, the JIM acknowledges Islamist rebels seized at least nine functional helicopters as they took the whole Idlib area in the spring of 2015, air defense posts and all. "However, the investigators from the OPCW-UN cast doubts over the truthfulness of the version, under which the air attack had been carried out by the militants." Either way, the incident the JIM found clarity on is probably too early for the second option to be relevant - the attack was March 16 (details below), and the major offensive only started at the end of March. The other incident was a year earlier. But in both cases under study, so far as we know up to now, there is absolutely no proof of a helicopter's involvement. If any chlorine was even involved, that third option remains open and valid to consider. In April-May, 2014, there were four alleged chlorine attacks with fatalities in the same area of northern Hama and southern Idlib provinces. The one the OPCW found clarity on was April 21, in Telminnes, Idlib. A Reuters report shared realistic detail, including reference to one "young boy" documented as dying and nearer to the Turkish border, seen in a Reuters photograph (will see about finding this). Opposition sources (VDC) have at least three fatalities listed: a boy of a Nawas family, aged 7, who died on the 21st, and two delayed deaths in Turkey, both listed on April 25: A Nawas girl aged 14, and their apparent mother, all from Telminnes. Video footage showed yellow canisters marked Norinco, a Chinese arms manufacturer, twisted by violent explosions. It was a kind of inconclusive they didn't want to sort out, like the kind they received about the Houla Massacre in 2012. Is that a coincidence, or did they have something shady about these IDPs proven to them? Either way, I must add here: listing never did equal truth. It could be none of these were displaced or hostages, or that they all were and the one batch was just listed differently. (Sept. 10:) -- Reviewing the report, as Robert Parry noted here, (and see report pp 52-59) the issue seems to be a jumble of confusion and signs of deception. Dates are confused, witnesses brought in second-hand activist info, stories change, locations couldn't be determined, conventional explosives may have been used instead, etc. Some witnesses provided by the government side "[came] forward to contest the wide-spread false media reports.” Those claimed that these attacks, and especially the one on April 29/30, never happened (although they really couldn't prove a negative...). Residents report various kinds of warnings of impending attack, told to evacuate to a safe place with soda-soaked diapers as gas masks ... and returned to find their homes had been looted while they were gone. This is all speculative, as evidence on these attacks is thinner, and ACLOS analysis was also limited. But the more emphasized attack in 2015 is something we can really add some perspective on. A family of six, named Taleb, was reported killed in their basement apartment after a barrel bomb tore through the roof in Sarmin, Idlib, the night of March 16, 2015. This was chosen as the OPCW's centerpiece for 2015 attack, presumably, because it was the first and worst in a series. Reminder attacks in the Idlib area followed, most of them more vague, with less evidence, and 0-2 deaths each. And these came after the rebel offensive, meaning they could have their own helicopters. Here, we have the highest death toll, and earliest date at once. But we also have much evidence that, properly analyzed, directly contradicts the activist claims. Some videos are credited to Idlib Civil Defense (White Helmets), and others to JaN. The famous views of the dying babies were divided; a JaN camera took one video while a White Helmets guy recorded the other. 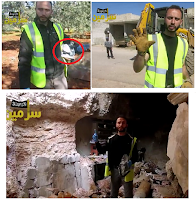 Most of the video field reporting connected to this incident was by this apparent civil Defense worker and host of several videos produced by Al-Qaeda affiliate Jabhat Al-Nusra (JaN) and/or Civil Defense, often sporting a long-sleeved sweater with "21" down the left sleeve. We're not sure who this is, a member or just an ally of the terrorist group, but he seems to know all about just what happened here. Why trust the word of Al-Qaeda terrorists and their close affiliates? They all blame a chlorine "barrel bomb" from "Assad." The most crucial parts of accepted evidence for the Sarmin attack come from an opposition-affiliated doctor, Mohamed Tennari (seen at right, along with the Syrian-American Medical Society director, and an alleged survivor of the Ghouta attack). As Ms. Power reminded the world, "In April of last year, members of the Security Council met with" this witness, at her arrangement. 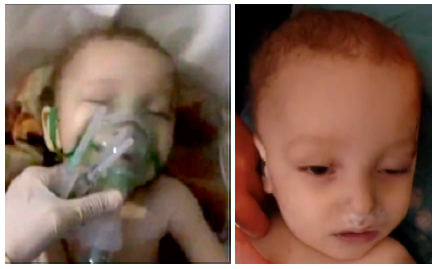 He "dealt with a chlorine attack," she explained, and "played for the Council the video of his team’s attempt to resuscitate children after the gruesome attack." But at the time, she bragged that everyone was reduced to tears and thus, implicitly, might not be thinking straight. She told reporters "if there was a dry eye in the room I didn't see it." (BBC) But teary eyes don't see very well, so maybe she, or others, missed some details we won't miss below. Later, Tennari would exaggerate damage to his clinic in an alleged Russian airstrike, in October, 2015. He would say 13 were killed there, including three staff members, and the clinic was left inoperative, in the 11th and worst directly attack on it. 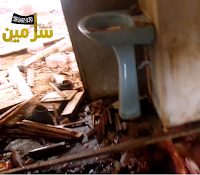 However, video shows how the two missiles both missed the clinic by a long shot, and the worst damage shown is a trashed room with intact windows (ACLOS). In both instances, he has offered false stories involving several deaths in Al-Qaeda turf. Why? And why trust his stories? Dr. Tennari or Mr. 21 above might know why the Talebs and relatives had such bad luck in those days, but they may not be telling. The killed grandmother was named Ayoush Qaaq (or Qaq) - a rare name, at least in casualty records. It could be a sign of targeting as 3-5 more Qaqs and several of their relatives died suddenly in the following days. But these too were blamed on a vacuum missile and other indiscriminate regime attacks. (ACLOS) Why trust the implication that this is all coincidence? Following a 2014 alleged chlorine attack, a Reuters report spoke of a "young boy ... lying dead on a stretcher with blood around his mouth." This is consistent with the mechanism of chlorine: hydrochloric acid is produced on contact with water. Eyes, lungs and airways will be damaged and bleed, then secrete masses of protective mucous. The victim doesn't loose consciousness until the end, but coughs violently, and may display cyanosis (blue discoloration), besides skin irritation or burns.Getting it bad enough to die would be a truly horrible experience. There is one apparent bomb strike in town shown with bleached grass, suggesting chlorine was released there. There are claims of widespread breathing problems and videos of people wearing oxygen masks. The record suggests some chlorine was released, but the full range of connections is not automatic. Allegedly trapped with a fatal concentration of chlorine gas for too long, the six members of a Taleb family should be coughing violently, perhaps with blood and mucous, and have red or damaged and swollen eyes, and skin irritation. Instead, as covered and widely-seen now (What Killed the Talebs? ), they appear much different. The adults are little-seen and unclear, but the children, Aysha, Sarah, and Mohamed - all aged 5 and under, disprove the chlorine accusation. They do display mild cyanosis (purple lips), but this has many causes. There's no hint of redness in the eyes or skin, and they aren't coughing, with blood or otherwise. If they were exposed to chlorine at all, it was minimal and irrelevant. In fact, they're evenly pale, limp, and unresponsive, and apparently not even breathing. They seem dead, but are at least partly comatose. Sara shows no sign of life, but a man says Aysha is alive at one point, after many seconds of aggressively checking for a pulse as shown at right. The infant Mohamed is clearly alive and tries once to draw a deep breath, but he's also vomiting, and left on his back to suffocate and fade away. This causes bubbles, and from that alone, some sources claim the children are all "foaming at the mouths," which is taken by the lazy as a sign of chlorine poisoning. "Rather than any convincing package of chlorine indicators, the observable signs (pale, flaccid, almost completely unresponsive, with little to no breathing or efforts at it) point more to an overdose with opiates or similar CNS depressant drugs (see attachment 4). This happened at an opposition clinic in a rebel-held area, and is not likely to have anything to do with a passing government helicopter." These symptoms actually seem to be caused prior to Tennari's clinic (the girls are seen being rushed there after being washed outside, in the same limp state), but it would be done locally. Was this a bit of mercy? They couldn't mist the babies with acid, and opted for a more peaceful-seeming method? It would be less bloody, and painful, but terrifying: overdose survivors talk of claustrophobic panic and the inability to breathe, no matter how hard they try. This causes cyanosis, as seen. It can also cause vomiting, as we see with Mohamed. But simply being an infant causes this as well. No one at the clinic called this out as medical negligence in the "emergency room" sealed their documented deaths. The children are handled roughly, with strange procedures apparently more for show than to help. The grandmother's dead body is left underneath the girls the whole time, likely just to dramatize how little room they had. This "emergency room" really seems to be the dying and blaming room. 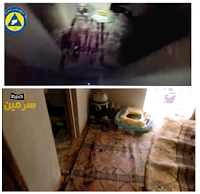 Once they were sent here anyway, it was the children's "fate" - as White Helmets chief Raed Saleh put it - to suffer “death in silence before the whole world.” (Guardian) And it had nothing to do with any chlorine. The color did seem a bit off, and eventually a non-obvious story emerged, with some kind of science to it. A red-purple fluid said to come from small plastic flasks inside the barrel bombs. Human Rights Watch heard it was unknown, not tested, and had no clear reason, but it was part of the bomb style used here and elsewhere. 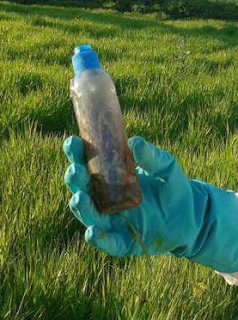 One recovered bottle is shown at left (Civil Defense photo via HRW). 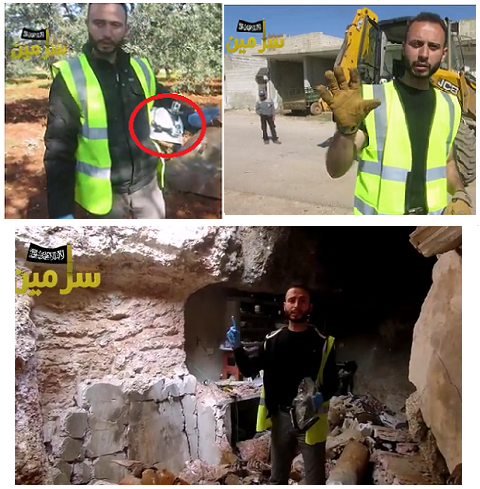 Other flasks of the same size have been shown torn, emptied, and often partially burnt.Puddles or reddish fluid were seen on prior videos of alleged chlorine attacks since February, 2015. 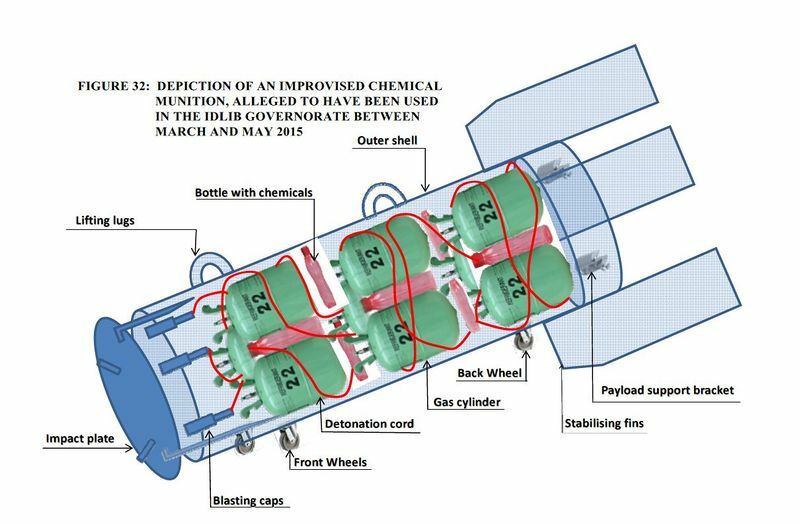 In late October, 2015, OPCW's technical secretariat produced an illustration of the alleged bomb, perhaps never published by them but leaked (ACLOS) and shown at right. In this, the barrel is filled with permanganate flasks, alternated with steel tanks containing the unknown reagent, presumably HCl (plastic lining would be necessary to keep it from dissolving the tanks). The proportions of the precursors might be drastically wrong here. But if so, we could presume the real, alleged, device had it right and this mock-up is just wrong. Apparently these would mix on impact/explosion, the front impact plate being the only trigger mechanism proposed. There's no room here for much explosives, perhaps because - as discussed at ACLOS – a blast would disrupt the mixing process. It would overpower and scatter the reagents before they could mingle properly. Maybe the detonation cord was rigged to just open the valves, and let the shell crack open? But it seems likely just the impact from high altitude alone would disrupt this system. This is an illogical proposition. It would be much more effective to just use chlorine gas instead of precursors, and then explosives could be used to spread it wider, with no mixing time required. The only reason to propose this is because we have these chlorine connected purple puddles to explain, and a "barrel bomb" aspect to maintain belief in. Synthesized On-Site, But NOT by the Bomb? In the end this fails at implicating a regime helicopter. Activists say the bomb didn't explode, just fell down a ventilation shaft, and knocked out a wall with the force of gravity. (some might say it smashed through the floor slab, but citation is elusive, and the visuals are inconclusive at the moment - light pours in through what must be a short shaft at best). There are at least two big problems with that. 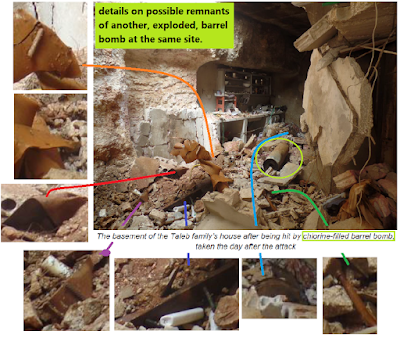 First, the site details are such that the barrel bomb may have been rolled down the stairs, not dropped by helicopter. - right, the basement level home, with only an unfinished floor above, compared to the areas where "not-blood" was seen - the hole above could be a shaft something did or didn't fall through, or a hole punched by a barrel bomb falling through, or blown out by a rolled device detonating from below. As noted, any sizeable blast would disrupt the mixing. At the alleged Taleb home, the barrel-type device is blown into twisted bits by a violent explosion that took down the home's kitchen and bathroom walls, and so could not likely disperse any chlorine. It was probably too full of explosives anyway to have any of that stuff inside. At right, the remnants of the blasted bomb, and the mysterious second tank that came in afterwards (?) or was packed inside and survived the blast unharmed. Lucky drop through the same hole? Actually, it seems they ignore the blown-up one and call this the delivery device. 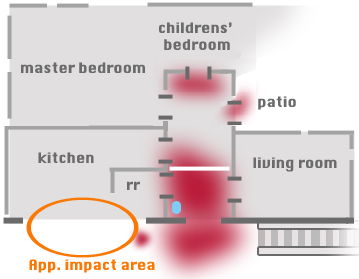 But the home is full of that red fluid; the volume seen is likely more than the whole bomb would contain, spread strangely down the central hall meters from the impact/blast area, and largely beneath the rubble. It seems quite possible that the bomb and the fluid are not directly connected. Rather, this might suggest someone in this rebel-held area used potassium permanganate and hydrochloric acid to generate chlorine, at this site. If these precursors can be mixed inside an Assad bomb, or on the ground in a lab, they could work in the field, maybe in a basement home, by anyone who has enough of these substances. They might come in canisters and jugs, manufactured for example in Turkey, by the Tekkim chemical company. It might be this method used by the "Wind Isber" Chemical Brigade to gas the rabbits in their infamous test video of 2012. Clear fluid poured on dark powder causes a purple fluid that bubbles and emits a pale, possibly greenish gas, which slowly suffocates the enclosed test subjects, causing eye irritation at least along the way. (ACLOS) Is this the same, done on a bigger scale inside a home? There are many gallons of this residue. The order of operations is clear: possible chlorine-generation, then the bomb incident, sending splinters and debris over and into preexisting puddles of red (right, just inside the front door). 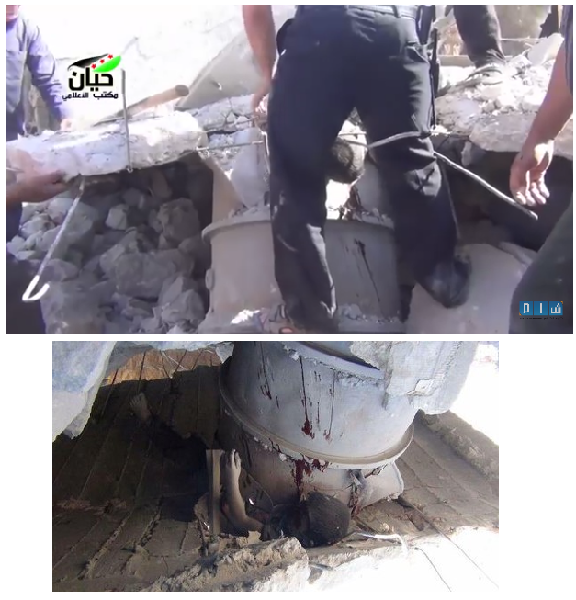 It was decided to acknowledge it as Assad's clever idea to use this method, inside his barrel bombs. Then the bomb was added, but that didn't make sense so ... maybe the second tank - with less space to hold precursors - was added...? Either way, again, the core victims that moved the world clearly did not die from chlorine, generated in any way, and show no sign of even being exposed to it. It remains unclear who, if anyone, actually was gassed at this site. New York Times: the UN Security Council "vowed to impose punishments in the event of noncompliance, including unauthorized transfer of chemical weapons, or any use of chemical weapons by anyone.” In practice, use by anyone at all, from any side, is to lead to punishment of the Syrian government. All the displayed certainty seems reverse-engineered to support that predetermined end. "When anyone – from any government or from any terrorist group – so flagrantly violates the global ban on chemical weapons use," Samantha Power says, in practice, she will find any way possible to blame it on Damascus and sternly hold them and them alone to account, logic and evidence be damned. When she held that special closed session for Security Council members to show them a video of babies dying, as Dr. Tennari (in his invisibility cloak?) tried to save them... that very evidence undermined the claims. But it seemed as if no one noticed, and so after that, "members of the Security Council cannot claim ignorance of the devastating, inhumane effects of these weapons," Ms. Power preached. No, now we all know the "gruesome" effects of chlorine, contrary to all prior learning, is just about exactly like an opiate overdose. And Syria must pay for this revision. Now that's smart power, way smarter than science and fact. Note on scope: only the last 2 years, mostly alleged chlorine attacks. They did not address and finally pin blame for the 2013 attacks, including Khan Al-Assal, Ghouta, and others before, between, and after - mostly ambiguous or clearly the work of rebel, once all the evidence is in. That was mostly all by surface rockets, which rebels had. Now it's all down to who has helicopters, and that's taken as obvious. As it happens, the JIM didn't establish whether opposition groups aside from ISIS used CW, like Jabhat al-Nusra when it conquered Istabraq, Idlib, last year (ACLOS), or Jaish al-Islam in an attack on Aleppo in April, which the group acknowledges (ACLOS). They managed to ignore 2 deadly attacks in 2014, are still considering a couple with no deaths (ACLOS), and decided to never solve three other 2014 attacks, as explained above. They're really whittling this down. "...under international pressure, (Assad) signed a treaty banning chemical weapons nearly three years ago after a horrific attack in which the nerve agent sarin killed hundreds in a Damascus suburb." (NYT) This was never proven. It's unsure how many hundreds, but hundreds did die, most or all in the rebel-held East and West Ghouta areas, but they didn't display signs of sarin poisoning, instead suggesting other poisons, and their bodies were never tested to find out what. (see here) The sarin that did turn up, possibly relevant or just planted, apparently did not fit the chemical profile of Syria's stocks, because rebels made it themselves. Certainly all motive arguments favor rebels carrying out this massacre. And the JIM chose not to look into it any further. "The United States has accused Mr. Assad’s forces of responsibility for that attack." (NYT) That adds no credibility, when the US also insisted Syrian forces gassed themselves and civilians in Khan al-Assal, Aleppo, in March, 2013. Damascus blamed rebels for what turned out to be a sarin attack that killed about 30, including soldiers and civilians. They sought a probe of this, but the Western powers openly stalled it for months. (see here). 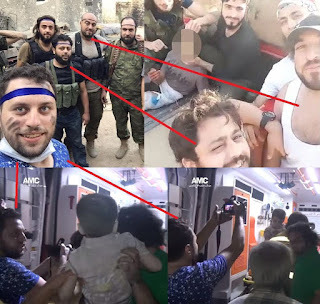 These investigators finally arrived in Damascus on August 18, but never got to Aleppo ... Syria stands accused of somehow killing over 1,400 in a depopulated area with sarin rockets, just in time to distract the investigators with a fresh attack just kilometers away, and get themselves blame for something far worse ... and right on the birthday of President Obama's "red line" threat-offer of August, 2012. Yes, embarrassing as it is to this American, this train-wreck of accusations does exist. There's been a broad consensus that Syria's sarin and fully-banned chemicals were gone after the deal brokered in 2013, for which the OPCW was given a Nobel peace prize. But this is undermined, as the Times noted, by he OPCW's unnamed director general, who "has complained in an internal report about misleading statements from Syria and potentially undeclared "chemical-weapons-related activities" there." This suggests, just as the report is emerging, even sarin and mustard gas might remain,with plans of criminal use down the road. And certainly that deceptive intent supports the use of chlorine in the meantime. Would we find it credible if - for example - Turkey's former ambassador to NATO and to Israel, and possibly controlled by Turkey's strongmen Recap Erdogan, helped lay unwarranted blame on an enemy of Turkey, NATO, and Israel? Because that's just who heads the OPCW: Ahmet Uzumcu, as not mentioned by the Times. That's whose government has been the chief sponsors and enablers of Jabhat Al-Nusra and their likes, and who just had to voice these doubts about Syria that emerged a day ahead of the report ... Under his management, OPCW officials were said to have a "feeling" that "no certainty could be had all the weapons were gone unless and until Assad is gone." (The Daily Beast) As usual for some people, there can be no rest until regime change, and then they know everything will be fine. A new Oxfam America petition calls on president Obama and Secretary of State Kerry for end to the conflict in Syria, with some kind of political settlement, and also urges them "to secure full implementation of UNSC resolutions that would help end attacks and sieges of Syrian civilians and ensure unhindered delivery of humanitarian aid." To "secure implementation" could mean "enforce," and could be the basis for a Libya-style air war or other military intervention. The enforcers might decide the only way to ensure those things is to eliminate Syria's government, as they did in Libya. The trigger event making now the time for this plea: a young boy named as Omran Daqneesh was injured in Aleppo, and images of him went "viral." Among hundreds of thousands of children wounded, killed, displaced, orphaned, or otherwise traumatized by the ongoing conflict (all in murky circumstances following on an optional regime-bleed campaign), one child is supposed to "say it all." 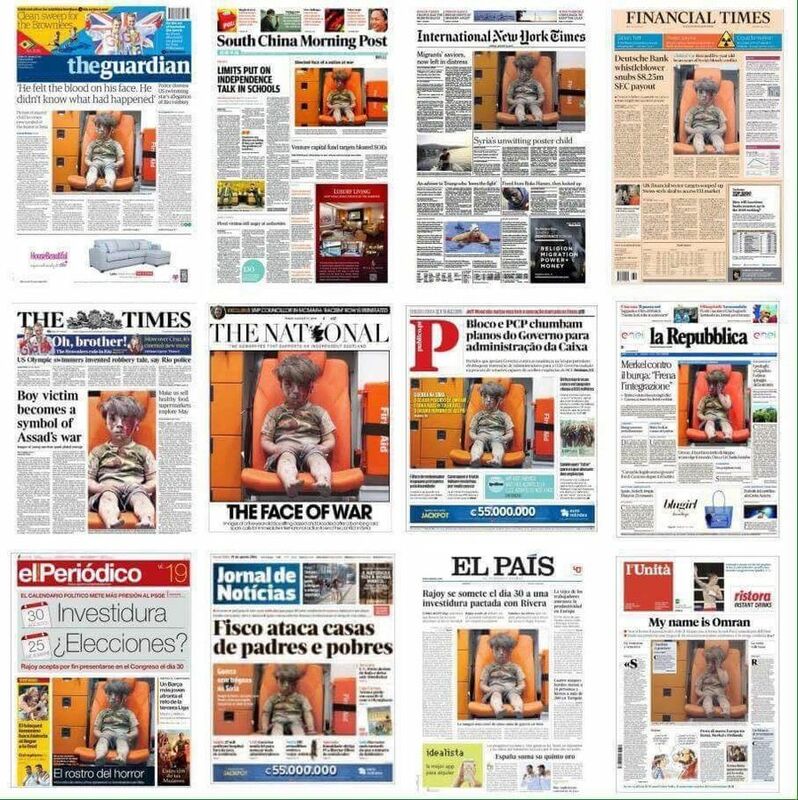 Unlike a previous "one child" fad, "Aylan Kurdi," * Omran is alive. Unlike thousands less-noticed, he's not too gory or distressed, just bland and front-page acceptable (see compilation at right). Some say the images are horrible for the ordinariness, coming with a gnawing awareness how many are even worse off, and have been, and will be. ** But they're also awful for how no one helps the boy for these moments, as he's left alone as if just for a photo opportunity (this is a horrible aspect of a lot of opposition videos of child suffering over the last 5 years). Also upsetting to some of us is how the picture is used by opposition activists to embody and prove allegations of indiscriminate bombing by their enemies (Russian air force in this case). In fact, as usually, we don't know what really happened here. Russia's military denies they targeted the area at all, but of course they would. Rebels and activists have been caught many times claiming regime jet attacks and the like that turn out to be rebel rocket attacks instead (see Douma, one year ago, for a solid example - mapping the arc of attack). 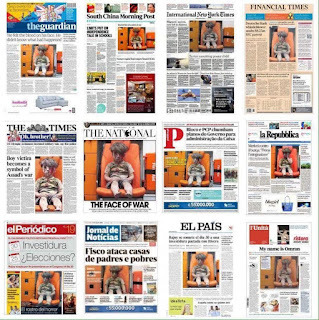 Oxfam's policy and campaigns media manager Laura Rusu blogged about how Omran's image "shook us to the core," and how she “found the images so awful that I could barely look. But then I forced myself to watch," and came out urging everyone "we mustn't turn away." She doesn't mean anyone should stare indefinitely at a photo or video of Omran. She means we must do something now to stop this suffering, and hence the petition. McCain has previously urged arming rebels and bombing Syria for them, since February, 2012, to topple the government in the vein of Iraq and Libya. In May, 2013 he went to Azaz, Syria, (north of Aleppo) and met some of the reliable, non-Islamist rebels who should be armed to end the violence. Upon returning, he seemed sure “we can identify who these people are. We can help the right people." But famously, it turned out some of those he was photographed with were sectarian kidnappers, according to Lebanese Shia kidnap victims (Antiwar.com, citing Daily Star). If that were true, McCain's office said, it would be "regrettable," but he didn't "knowingly" meet with - or arm - such people. (CNN) But he did meet them, and he did advocate the U.S. government using taxpayer money to arm such people. I'm not sure of McCain's current suggestion for how to bring peace, but it's probably based on just about the same sloppy replacement of wishful thinking for reality. This group - Harakat Nour al-Din al-Zenki - is branded "moderate Islamist" and is directly backed and armed by the United States, surely at McCain's urging. (Daily Beast) They likely used U.S.-supplied guns to shoot Abdullah in the leg so they could capture him easier and saw his head off. It's a horrible scene. Did we turn away? Either way, people are suffering. Both Oxfam (America) and Senator McCain claim to want urgently to stop it finally, by proposing the same new approaches they've been offering the whole time. Oxfam differs from McCain at least in emphasizing an apparently non-violent solution, that involves women, children and families, and things that start with "United Nations." Everyone who understands the conflict in Syria knows a negotiated settlement has never been plausible. But it sounds better than "anti-tank missiles," or "invasion," or even "no fly zone." No, the only path to peace is when there's a solid shift in the military situation - either toward how things were in 2010, with the government of Syria alone running security, or very far towards what the Islamists want to see. Everyone who thinks they have a chance will at least fight a bit longer to improve their hand at any negotiations. Only once the end is truly obvious to all will all agree to negotiate a stop. In the most extreme cases, the final talks are a few guys in a warehouse negotiating their surrender. 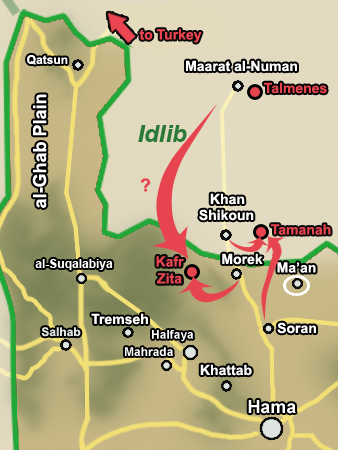 Then, with no more opposition fighters, guess what happens? Peace. No more dusty injured kids. So ... McCain is either exactly right or exactly wrong, and all these clean-seeming "middle ways" are actually what drags the answer out, and causes the prolonged instability, the death and pain, the grief, the refugees, the Islamic State. If you're tired of seeing pictures that make you cry, then quit trying to sound good and on-script. Focus on the real world these people actually live in, not the sanitized version handed in by these Islamist "activists." Form an accurate view of the true problems. From there, the confusion will clear up, and realistic solutions can be found. And you'll find a hell of a lot of Syrians already there and working on it. They could use some help, or at least less obstacles, to speed this thing up. And that's it. Any kind of realistic, clear-headed help could finally tip the balance back towards a sustainable peace. 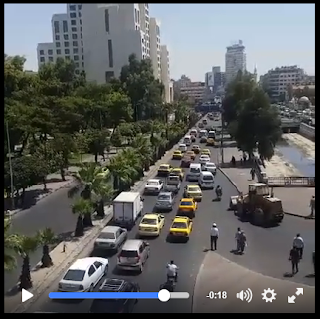 I was just alerted to this important video from Sham FM in Damascus, on Facebook (still frame below): This is "Center of the capital Damascus now.." The location is not hard to pin down - a mid-day view, apparently before noon, on Shoukry al-Qouwatly Street, here on Wikimapia and facing east. For the first minute, it's arguably boring. Taxis and a few other kinds of vehicles merge and drive normally. There are quite a few of them, but things keep moving. An unarmed traffic cop helps manage a process that hardly seems to need the help. ... well, it carries on and keeps driving like any car. The video goes on like that a few more seconds and then ends. It's not a direct massacre, but surely the work of the dictator Assad and backed by all his other crimes. There's not a challenge to be seen here to his iron grip and genocide of the Sunnis. We see not one mortar shell nor sign of any recently. There are no soldiers massacred for refusing orders, no bodies rotting in the streets because of snipers. There are some embargoes but probably no one is being starved to death in basements for propaganda videos. There are no bearded fighters in ratmobiles on the street, and no public beheadings. The women aren't veiled, and Christians and Alawi can probably move about freely among the Sunni majority here. As with so much of Syria, there are also no NATO bomb falling here. 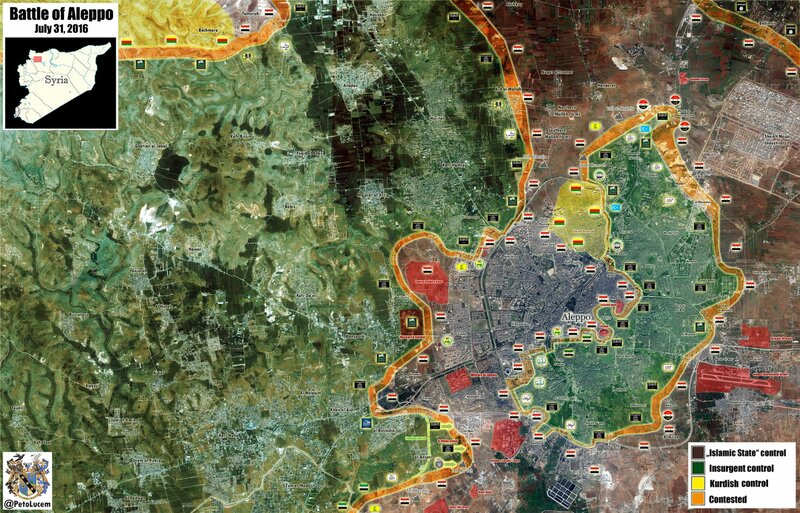 This could be the fate of Aleppo if Assad wins there. Pay attention, people. There will be no more reason for refugees to pour out of Syria. That would be one less crisis, one less reason to come and topple Assad. What's next? ISIS finally being eradicated? When will the world stand up in defense of useful crisis? Damn this dictator and his slaves, clinging to power with the help of Russia and Iran, and their little pariah club. This kind of white-washed stability has to end in all of Syria, just like it's done in Iraq and Libya, and much of Syria. Only then can the long path to true freedom begin. And freedom, sweet freedom - that's just another word for nothing left to lose, right? On August 12, there was another alleged Syrian or Russian aerial crime against the Syrian people, and activists were all, like "where is the world?" and so on. Frantic locals check for signs of life, sob, and perhaps explain who's to blame and how they know. They often get all this together for the cameras. Syrian Civil Defense ("White Helmets") assist other activists to recover the bodies. An air strike is blamed. This might well be worth a closer look, and there's a good start at ACLOS, and what should be a lively talk page. Here we're collecting photos and videos and so far, one vague report, and some scrutiny of the kind these claims usually aren't given. 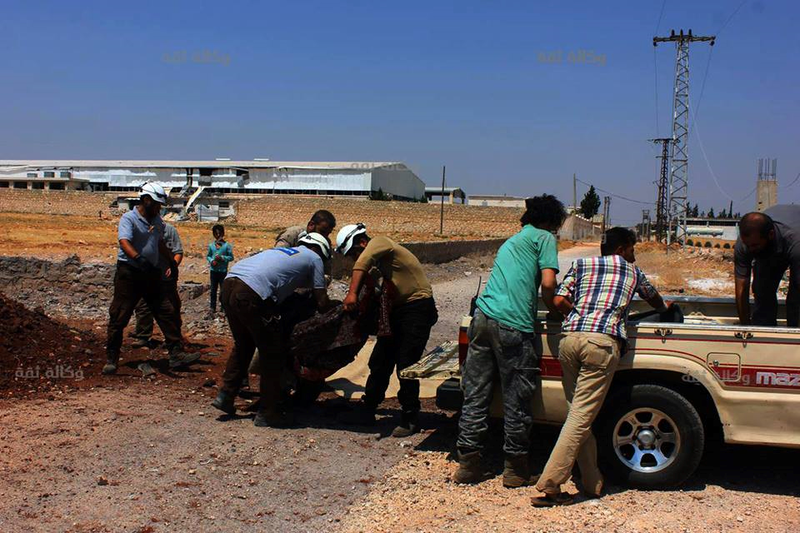 SNHR report (with photo used above): "At least 12 victims including 5 children died in government warplanes missiles fired on Hayan town in Aleppo governorate, August 12، 2016." No further information is provided. There might be 12 victims total, with 2 unseen so far. SNHR's blog post doesn't explain how they know it was bombing, let alone whose, that killed these people before someone dumped their bodies here. They might explain, when and where and if they do, that locals knew just who these people were, why they were walking here, and whose jet they saw drop bombs here - maybe even cutting off a live phone conversation, just minutes earlier. But those would probably be lies. Note: there's no sign of a vehicle. The group was apparently walking here when they were blown up. Or so, we're to presume. 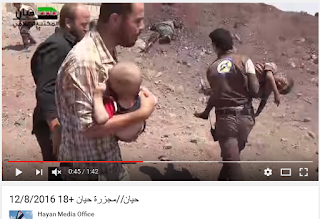 At 0:45 in video 1, at right, an activist with the SCD logo but no white helmet runs with a boy who's clearly dead and rotting like the rest. What's the emergency? The camera's on, must look "frantic," logical or not. Another man carries a living child with no sign of injury, reason unclear. He seems less hurried, gawking at the mangled bodies as he walks that baby around. Hayan is about 9 km north of Aleppo, but the incident is a bit west of town, here on Google Maps, at the intersection of those two roads (geolocation credit: Petri). The above photo looks northwest into that walled compound. This is the middle of nowhere, basically, called Hayyan - Bayanoun Industrial Area on Wikimapia. Why would they all be walking here? In war time, there are few possible reasons... (Aug. 18: AFP heard this came during a supposed 3-hour cease-fire Russians had agreed to, to let people go out and re-supply. Perhaps all 12 of these people were out to get supplies? None are seen, must be on the way out?) But they seem more tumbled into place anyway. This area is mostly administered (as of August 1 map) by Jabhat Al-Nusra aka "the new name for al-Nusra." Nearby and notable: Zahra and Nubol, government-held but besieged Shia villages about 5 km north, Başemra, Ezidi (Yazidi?) Kurdish village, 5 km west, Kurdish controlled, but also marking the front line. Minorities might still be available in surrounding areas, or even in these towns, at times. But the terrorists formerly known as Jabhat Al-Nusra also have plenty of other people they have reason to kill, here and in related areas. This is interesting. The opposition VDC, who just re-designed their website, is still keeping track, if not doing the math to make sense of events. VDC lists 19 civilians from Aleppo killed by "warplane shelling" August 12. 12 are from "Hayyan," clearly the ones spoken of, but here blamed on Russian forces bombing, like most others. For Hayan, there are 3 unidentified boys, and 2 boys, 3 girls, 4 women, and no men at all, named as members of a Qraitem family. It seems the group was (allegedly) walking here with no men and with no clear reason. Usually, all indiscriminate attacks kill almost nothing but adult males, at least in these VDC records (different categories average out between about 60 and 90% men, with the rest divided between boys, women, and girls notably dying in the smallest numbers). I usually suspect this means gender-segregated captives. Whole families can be seized, and the men killed automatically, per established religious rulings. Women and children are supposed to be spared for other fates, and it seems they usually are. When regime or Russian bombing is blamed, or you're about to flee an area, all bets could be off, and sometimes are. But usually, it seems they stick to the plan and mostly have the bombs just kill men. But here, there are none. Why? Four women might be 3 wives and a sister, second wife, adult daughter, etc. These might well be two portions of the same divided family. The men were singled out, here in turf managed by Al Qaeda (informally now), to be killed by government bombs. Then later, for some reason, the bombs ditched the chivalry or adherence to the fatwas, and went ahead and blew up their women and children as well, two weeks later. And then dumped them, and blamed Russian jets. Damn Assad and Putin and their family-dividing bombs, right? Where is the world? Why isn't all of Syria liberated to be run this way? Previous: Unexploded barrel bomb crushes boy in Hayan - or, right-side-up, he was somehow crushed between a floor slab and demolition chute segments, in some kind of a building collapse, or ...??? Update: it was covered, I forgot: June 4, 2015, ACLOS. One man of this same Qraitem ( قريطم ) family was killed this time, besides 5 boys, 1 girl, and an elderly man of a Haik (or Hayek - حايك) family.